Because of how easy and tasty this chicken is, it’s one of my favorite meals to make for the family. My kids absolutely LOVE it! I usually start this dish just after school so that it’s ready just in time for dinner. I serve it with brown rice and veggies (and a little a lot of wine for me) to complete the meal. 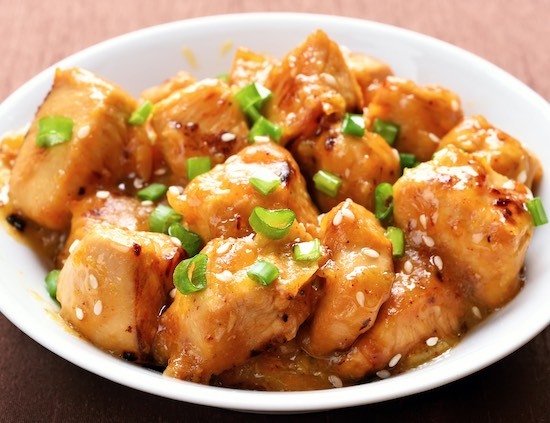 Cut 3-4 thawed chicken breasts into bite sized chunks and cook them in your slow cooker on MEDIUM for about 1 1/2 hours (for best results stir half way through). There is no need to add anything. The chicken cooks well in its own juices. If your slower cooker doesn’t have a medium setting, let the chicken cook for 2-3 hours on LOW. While the chicken is cooking, mix together 3/4 cup BBQ sauce, 3/4 cup orange marmalade, and 2 tbsp of soy sauce until well blended. After 1 1/2 hours, drain the chicken juices from your crockpot and pour your mixture in the crockpot with your chicken. Be sure that the chicken is well coated and mixed in with the sauce. Cook on MEDIUM for an additional 2 hours (you may need to add more time if the chicken is not done). The sauce may appear a bit runny at first but it thickens quite a bit as it cools. Again, if you don’t have a medium setting, add an additional hour on LOW. This chicken is wonderful served with rice. I also like to top it with sesame seeds, and usually cook broccoli and carrots to serve on the side. Add red pepper flakes and/or Sriracha sauce to the mixture to turn up the heat. Add chopped onion and bell peppers to the crockpot when you add the mixture for added flavor. You can also cook the chicken on LOW, just add more time. Just be sure that the chicken juices are drained before adding the mixture or it will be watery. Every slow cooker varies. These are the heat settings and times that work best for me.